Harken has put together a nice video that explains the difference between a ratchet block and a ratchamatic block. I’ve traditionally used the 2135 (shown here on my mainsheet controls upgrade post), as it is usually cheaper, and the switch is usually easy enough to reach if I wanted to release the ratchet mechanism to allow the line to run freely. for a Sunfish sailor looking to race, the 2625 might be a better option as it will let the mainsheet out easier when your time spent changing tacks could make the difference in a race. APS has a quick promotion going on right now for Sunfish sailors – 10% off on orders over $100, from now until August 15, 2017. Sunfish parts can be found here. might be the perfect time to upgrade your Sunfish lines package, and maybe get a Harken ratchet block and the other various parts for your mainsheet block upgrade. I’ve written several posts in the past about upgrading to a Sunfish mainsheet ratchet block and the associated rigging to control your mainsheet. I really enjoy playing the mainsheet through the ratchet block, and enjoy how the sheave on the ratchet block grips the mainsheet, so that the amount of pull I see is reduced, helping to keep my hands and arms from tiring as quickly. I also like that this setup will force me to focus more on the sail trim, instead of just using my old setup to set it and then forget it. I’d highly recommend this upgrade to other Sunfish sailors. the Harken 2135 ratchet block, in particular, has grooved edges on the inside of the sheave. these grooves help to “grip” the line and reduce the amount of line pull by a factor of up to 10:1. so if the sail is pulling with 100 lbs, your hands gripping the mainsheet could see a reduced load, maybe as little as 10 lbs. over a long day of sailing, this will be significant! part numbers and such are strewn along between the various blog posts, so I wanted to pull everything together in one place with a nice summary parts list and I made a labeled diagram to show what parts go where. 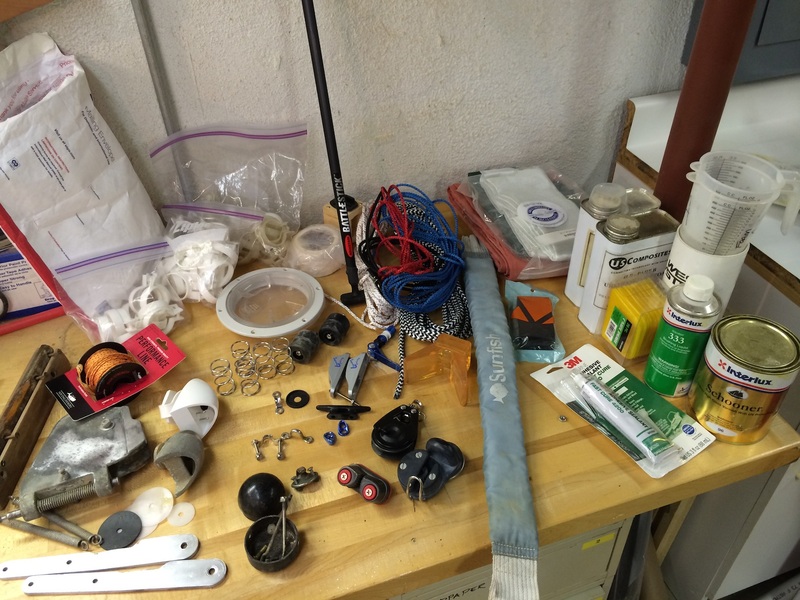 the picture is from our Minifish, but a similar setup is what I use on my Sunfish as well. all told, you’re looking at an upgrade in the $70 to $100 range (depending on which ratchet block you pick). if your Sunfish was a barn find or a cheap pick off of craigslist, this might be a lot compared to the price of your boat, but trust me: you’ll be happy with the upgrade if your current Sunfish setup only has the old “knee-knocker” hook at the lip of the cockpit. I was trying to organize my basement shop, and had my sailing supplies in 3 or 4 different boxes. I decided to organize them a little better, but before I did that – I laid most of it all out on one of my workbenches. there is a little bit of everything there: an old rudder head that needs to be cleaned up. a pair of old tiller straps that have been polished up to look almost like new. a new tiller extension (a Ronstan Battlestick). bailers, old and new. sail rings, old and new. inspection ports. 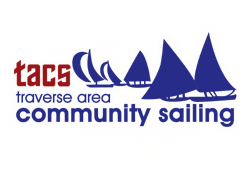 new lines – a mainsheet, halyard, outhaul and cunningham. cleats – cam and clam. two options for Sunfish mainsheet control – a new ratchet block and an old swiveling fairlead and cleat. eyestraps, standup springs, hiking straps. Interlux varnish, West System epoxy stuff, and the remains of my 2-part expanding foam (use to reset my foam blocks). anything else I should add to my collection? 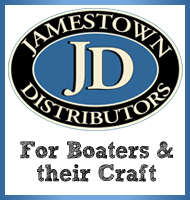 the following is is from a contest put on by Jamestown Distributors (JD). the contest was called “pimp my boat” and the contestants would post before and after pictures of boat repair/restoration projects that they had completed (presumably using some supplies from JD). this particular contestant was repairing a 1970 Sunfish sailboat. his “before” picture is downright frightening! but I guess it was only $50. but after I’m sure quite a bit of work, the final result is mighty impressive! stop by the website for his project to see more pictures of the process and final results. maybe it will give you an inspiration for a repair project this winter. do you have any projects planned for your Sunfish during the winter months ahead? just a few days ago, I saw this sweet how-to video posted over at the Sunfish Forum for doing your own fiberglass repair to fix leaks or hull damage to your Sunfish. doug does a sweet job of narrating the process and putting the video together, and makes the whole process look pretty simple! and, all this from a first-timer, no less! This is a video of a repair I made to one of my early 1970’s sunfish that had a split in the hull underneath the cockpit. For me this was a first time fiberglass repair. 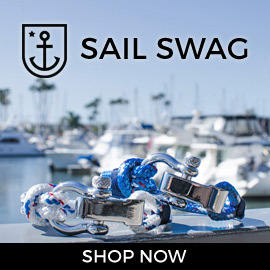 here are 2 videos that I just recently saw posted at the Yahoo Sunfish Sailor Group about modifications to make your hiking strap have some ability to adjust the tension on the hiking strap while sailing. in this first video, Dayton Colie goes into a little detail on how David Loring, the 3-time Sunfish Worlds champion, customizes his hiking strap to give him to capability to adjust the tension on the hiking strap while in the middle of racing out on the water. it does involve making a custom attachment using webbing material and some grommets. Dayton Colie and David Loring collaborated to make a pretty sweet DVD called “Back to Basics for Sunfish World Championship Speed” – it’s available from most Sunfish dealers, including Intensity Sails. the video could stand to be updated for HD, but it is still a great video, with rigging tips as well as tips for while out on the water. in the second video, Eduardo Cordero and Paul-Jon Patin display some what their sailing coaching school, Starboard Passage, has to offer. the hiking strap customization is at about 0:55 with more comments throughout the video about it. there are also a ton of pictures on Sunfish rigging at Starboard Passage.